Thanksgiving is the perfect occasion to think about all the things we usually take for granted throughout the year. And that includes our ability to hear. While sight, taste, and smell are at the front of our mind during the holiday season, hearing often takes a back seat—that is, until we start paying better attention. To truly enjoy the holiday season requires being fully present, and that includes being alert to all the sounds that normally escape our full attention. Below are five sounds to be mindful of and thankful for this Thanksgiving. The sound of food sizzling – You can’t match the aroma of roasting turkey filling up the house, but have you ever paused to appreciate the sounds of a busy kitchen with food popping and sizzling and timers going off? With a house filled with hungry guests, you’re especially not going to want to miss those timers. 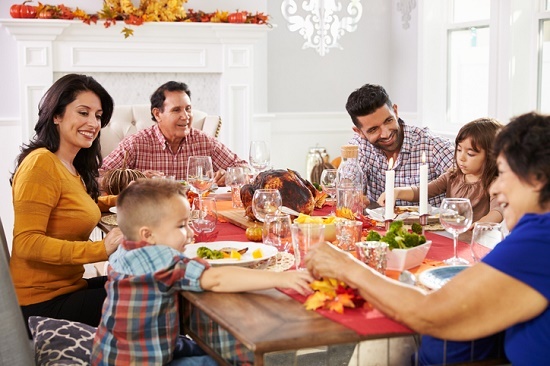 Conversations around the dining table – The holiday season is a chance to get everybody together for engaging conversation. You won’t want to miss out on any big news or interesting stories from friends and family you hardly get to see. And as for those you’d rather not hear from, you’ll just have to choose your seat at the table carefully. Thanksgiving day football – To the discouragement of many non-football fans, the NFL has somehow included itself into the holiday tradition. But for the sports fans in the family, the sounds of the crowd, the big hits, and the eruption after a touchdown are difficult to match in intensity. Thanksgiving day parades – The sound of marching bands and cheering crowds in the background is a staple of Thanksgiving day. You’ll want to ensure that you catch all of the music and festivities. Holiday movies – Has anyone ever not eaten too much at Thanksgiving dinner? After the heavy tryptophan-filled feast and plenty of socializing, it’s nice to unwind, relax, and watch your favorite films. All of these sounds enhance the complete Thanksgiving experience, and the more mindful we are of them, the more we can enjoy the day. It’s part of being fully present and immersing yourself in the moment. Unfortunately, hearing loss can dull or eliminate many of these sounds. Missing out on important conversations, or not being able to hear the dialogue in movies, brings about stress and anxiousness that should have no part in the holiday celebrations. That’s why we’re inviting people with hearing loss to give consideration to the use of hearing aids in advance of the holiday season. Hearing aids can amplify all five of the above sounds, bringing them into sharp focus, potentially for the first time in many years. It’s time to take back your holiday season—book your hearing test today!